If I sudo or logon as root and try the same I don't get any colours at all other than white text on a black background. Are these schemes mostly aimed at gVIM and is PuTTY just not able to display these colours? I've google'd around a bit and bumped into articles such as this one but they don't appear to work. This means that even if your version of Xterm does support 256-color mode, programs won't know about it. The easiest fix is to set your $TERM environment variable to xterm-256color. You can tell PuTTY to always identify itself as xterm-256color, via Configuration → Connection → Data → Terminal-type string. Note: If you use #1 or #2, and you connect to a server which doesn't have the apropriate terminfo entry, all TUI programs will break. You can also set the 't_Co' option in vim to 256 to override the terminfo value. Or you could edit the terminfo database. The updated entry will be kept in ~/.terminfo. Not the answer you're looking for? Browse other questions tagged vim centos colors putty or ask your own question. How can I prevent OS X Terminal.app from overriding vim colours on a remote system? 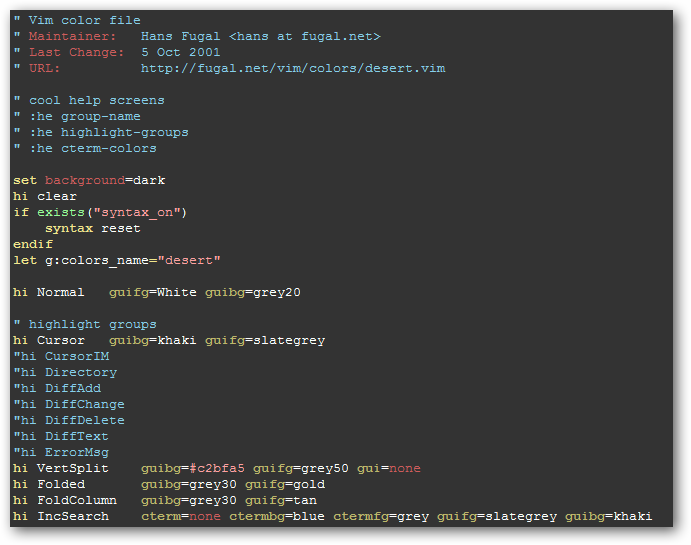 How to grep for VIM colour schemes that do not use dark blue?